Foaling season is an exciting, anxious and tiring time. To make things run as smooth as possible it is important to be prepared for foaling, whether it be routine or worst case. 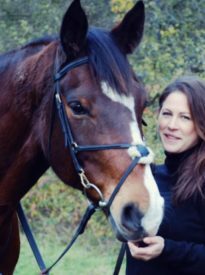 The 4-6 weeks leading up to foaling is an ideal time to carry out everything from vaccinating to worming your mare and ensuring she is accustomed to the environment that she will foal in. 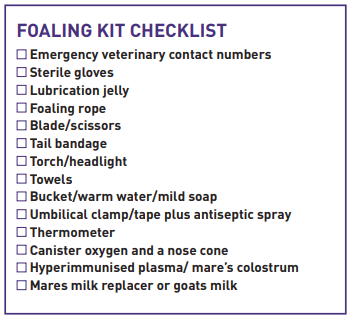 It is also the ideal time to prepare your ‘foaling kit’ (see box). Foals are born immunologically naive, meaning that they have a fully functioning immune system, but as they cannot derive immunoglobulins from the mare in utero they have no circulating antibody. Whilst in utero, the foal has a bloodstream separated from the mare’s by the placenta, the placenta has 6 layers and these prevent immunoglobulins passing. More important than any feed product to the health of a newborn foal is good quality colostrum. Colostrum, a yellow, thick, sticky fluid, is produced by the mare during the last few weeks of pregnancy as a response to hormonal changes. Colostrum is quite distinguishable from milk and is rich in immunoglobulins, specifically IgG. If colostrum resembles milk this is a strong indicator that quality is poor. 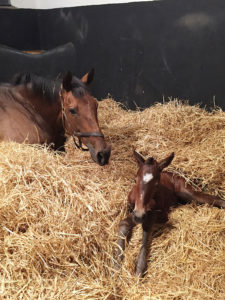 Foals need to ingest colostral immunoglobulins soon after birth, a process known as passive transfer, so that their immune system can defend against pathogens. This is heavily reliant upon the foal standing and suckling from the mare. 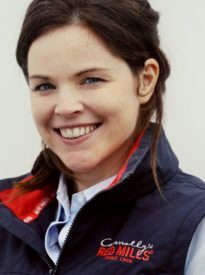 Some reports advise that the foal must suckle within 8 hours to maximise IgG absorption. This is because specialised gastrointestinal cells in the foal’s small intestine will only allow absorption of these crucial, large immunoglobulins for approximately 24 hours and the efficiency of the absorption will start to decline as early as 6-8 hours. 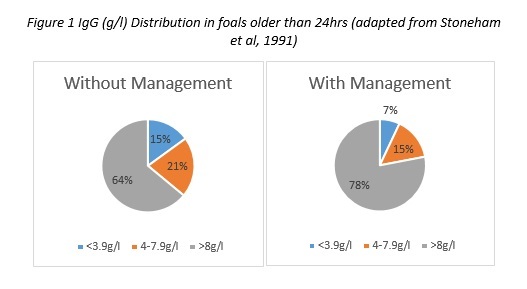 Failure of passive transfer (FPT) of antibodies occurs in 10-20 % of newborn foals. Complete failure of passive transfer (FPT) is defined as a circulating level of IgG of less than 400mg/dl at 24 hours of age, partial failure (PFPT) is classed as anything between 400-800mg/dl. Failure or partial failure of the passive transfer of antibodies via colostrum significantly increases the risk of life threatening infections. Testing the foal’s IgG level at 24hrs is advisable, if it is below the above figures IgG can be provided via hyperimmunised plasma given intravenously. Are limbs all normal i.e. not contracted? 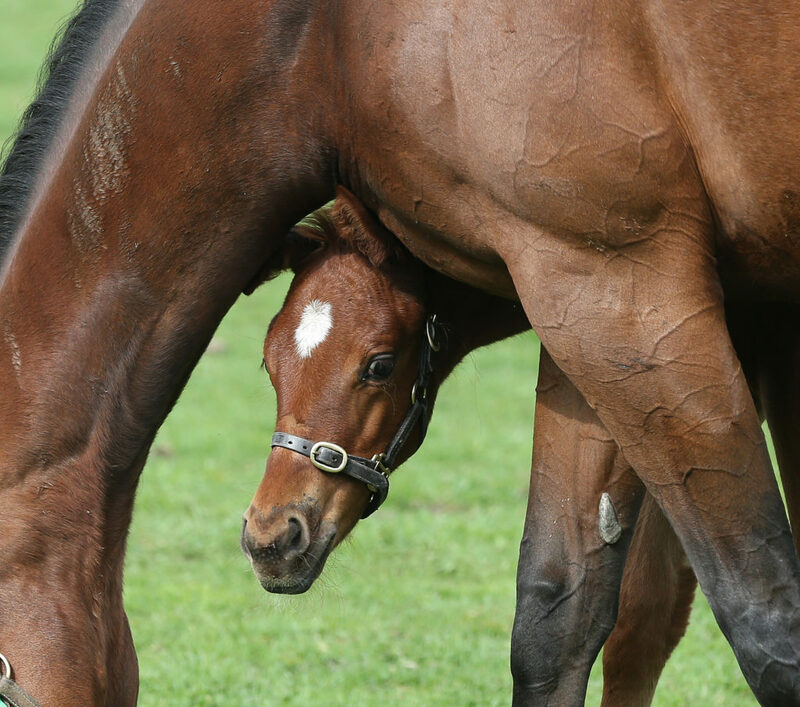 Has the foal stood and nursed? If a difficult foaling occurred is there damage to ribs? Provide supplemental Vitamin E to the mare during late pregnancy as this has been shown to increase colostral quality. Monitor the foal closely and make sure it is “latching” on and suckling successfully. If the dam has plenty of colostrum but the foal is too weak to stand and nurse, the mare can be milked and the colostrum given via a nasogastric tube by your veterinarian. 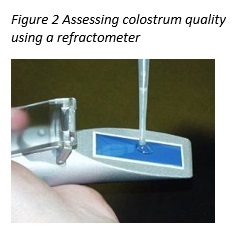 Assess the quality of the mare’s colostrum by measuring the specific gravity using a refractometer or a colostometer. If it is not adequate, provide donor mare’s colostrum or have the vet administer hyperimmunised plasma intravenously. If NI occurs the foal must be muzzled and given an alternate supply of donor colostrum or an intravenous supply of plasma. Respiratory rate should be greater than 30 breaths per minute (typically 60 for the first few days). Typical body temperature range for a foal is 99.5-102°F or 37.5-38.9°C. Stand & Suckle: The newborn should be attempting to sit sternal within 5 minutes of birth and the suckle reflex should be seen within 20 minutes. Within 1-2 hrs the newborn will attempt to stand and, with a few wobbles here and there, should be suckling successfully within 2 to 3 hours. Before leaving the mare and foal alone it is important to check that the foal is fully latching on to the mare and suckling successfully. If the foal is not nursing within 6-8 hrs contact your veterinarian who will be able to determine why the foal isn’t nursing and, if necessary, advise you on the most appropriate method of providing nutrition. Meconium: Meconium, the first faeces, should be passed within 24 hours and is a good indicator of normal gut function. It is good practise to make a note of the colour, consistency, the amount passed and the time that this occurred. Meconium staining at birth is a sign of stress and may indicate an increased risk of other serious problems including aspiration pneumonia. Similarly, excessive or unproductive straining and signs of colic in the newborn foal are abnormal and may indicate a problem. In both situations, veterinary evaluation should be performed as soon as possible. Urination: A 50kg foal will produce around 7.5 litres of urine a day for the first couple of days. This means that you should see your foal urinate frequently – most will urinate each time they rise after resting. Straining whilst urinating, reduced frequency of urination, reduced volume of urine, a distended abdomen and colic are all abnormal signs and may be due to inadequate milk intake or a problem with the urinary tract. If you have any concerns seek veterinary advice immediately. Being fully prepared for every eventuality of foaling will help to avoid a compromised foal post parturition and by giving knowledgeable consideration to your mare’s colostrum quality and foal’s ability to suckle you will largely avoid the serious implications of FPT.